Freeze thaw action on masonry and concrete explained, including solutions for preventing it. 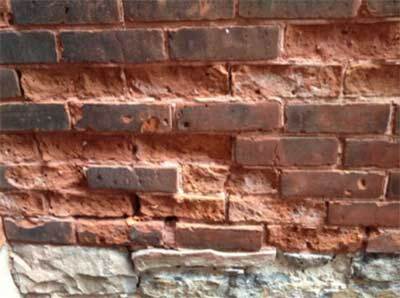 The face of my bricks are falling off - how to repair freeze thawed bricks. Understand what causes freeze thaw damage to bricks and masonry so you can repair and prevent it happening again. We also look at how Freeze Thaw affects concrete in detail. Freeze-Thaw action is responsible for a lot of external damage to masonry and concrete in areas where the temperature regularly drops below zero. Freeze Thaw is a mechanical weathering process where water penetrates the concrete or masonry then repeated freezing and thawing force the breakup the concrete or masonry as the ice expands in the cracks. The process is sometimes also called “Frost Shattering”. Most concrete or masonry, be it bricks, blocks or stone, have tiny fissures (cracks) in their composition. These cracks, however tiny, will fill with water when it is wet. As the weather gets colder this water freezes. Frozen water expands as it becomes ice and exerts a great deal of pressure within the crack. As the crack is already a weak point in the masonry, it expands a little under the pressure from the frozen water. When the water melts and runs away or evaporates, it leaves a slightly larger crack which fills with water when it rains…. and so on until the face of the brick is more crack than brick and simply falls off! This is called freeze thaw action and is responsible for a great deal of damage to external walls. There is no alternative here but to rebuild the damaged area and in the case of individual bricks, chop them out and replace them. Painted masonry is less susceptible to this action, but walls will need to be fully repaired and prepared before undertaking any painting. See our project on replacing bricks to find out how this is done. Why is Freeze Thaw so Destructive? This is the bit where we will get slightly technical, but don’t be put off as it is relatively easy to understand! Freeze Thaw occurs because water is very unusual. Most liquids when cooled reduce in volume (assuming the pressure is kept constant) and occupy the least amount of space when frozen into their solid form. Water does this until it gets to 4°C and then below this as you cool it the volume actually increases slightly. When frozen water (ice) occupies over 9% more space than liquid water. So, quite a significant increase in volume. This is a relatively unique property and vitally important for life as, for example, it means that the ice will float as it is less dense that liquid water allowing life to survive underneath it. If this did not happen all the fish in your pond would probably die every winter. The downside to this unique behaviour is that it can be very destructive. 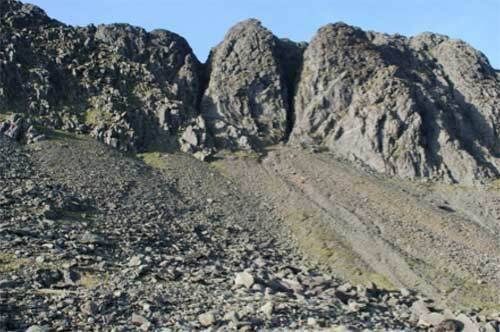 Mountains can be, quite literally, torn apart by Freeze Thaw. The scree slopes at the base of cliff are the pieces of rock that have been torn off by the Freeze Thaw action, or Frost Shattering. As you have probably guessed, freeze thaw is at it’s most destructive where the temperature regularly fluctuated around 0°C as this will cause the most freezing (expanding the cracks) and thawing (allowing more water in to fill the newly expanded cracks). This is bad news for us living in the temperate climate of Great Britain (and similar latitudes) where this is a daily occurrence for most of the winter! The good news is that to be most destructive, the level of saturation that is required to produce the most destructive freeze thaw action is quite high – typically around 90%. The more that you can reduce the water entering the pores and cracks in your masonry the less destructive the effect will be. As ever, prevention is a much better solution that trying to deal with the effects after the event. The best solution is to prevent the ingress of water into the brick, blocks or masonry where ever possible. This is why you have gutters, for example, to take away the water from the roof preventing it getting to your walls. 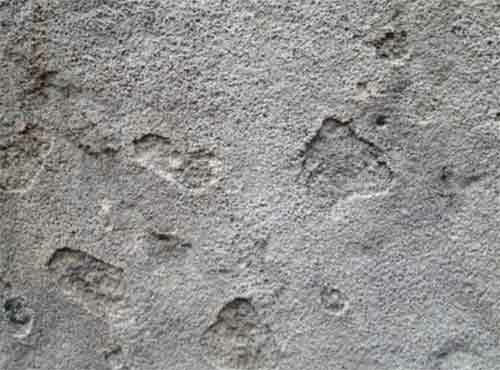 Where any masonry or concrete is likely to get water on it, it is advisable to try to prevent this happening. We mentioned painting the wall above, but you can also purchase sealants that will reduce the amount of water entering the pores and cracks. Seal exposed brickwork and masonry to prevent water entering. 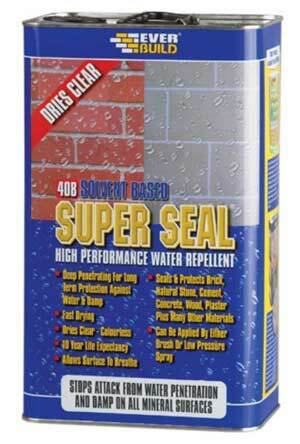 Buy this exterior wall seal here. You might consider rendering the surface of the wall to provide an extra layer of protection. Even if the render is penetrated by water and deteriorates over time (hopefully over a considerable time), it is easier to replace the render than to try to repair the wall underneath. When laying a patio or slabs outdoors, ensure that they are designed to be used outdoors. These will be more resistant to water ingress and therefore less prone to any frost damage. Ensure that you follow any instructions provided by your retailer especially when it comes to sealing the surface. 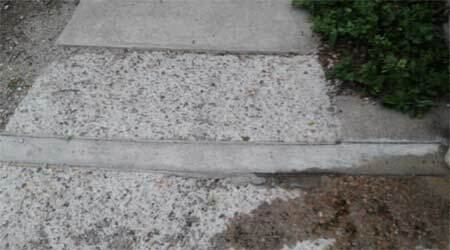 Concrete is a slightly special case when it comes to freeze thaw action and there are a number of way that it happens. Despite this, the end result it the same and it will eventually need to be replaced. Again prevention is the best course of action. As you can imagine there has been extensive research and development carried out on the different types of concrete as it is a huge industry, but you don’t need to worry too much about this. If you tell your builders merchant or concrete supplier where you intent on using the concrete they will be providing you, they will be able to advise. One interesting point about concrete is that of Air Entrainment. This is where air pores are actively encouraged in the cement or concrete. Given what we have explained above, this sounds like inviting disaster, but when created in the right way these air pores allow the concrete to be able to absorb the expansion of the freezing water without causing any structural damage. You can read more about this in Wikipedia who have a concise not-to-technical explanation. In summary, Freeze Thaw (or Frost Shattering) can be incredibly destructive and once it has begun it will accelerate until the masonry is disintegrated. The best solution is to stop it happening in the first place by stopping water getting into your masonry or concrete, but if it has happened you have to replace the affected area. The good news is that you do require a relatively high level of saturation before Freeze Thaw will become really destructive, as if there is sufficient air when the water freezes it can absorb the expansion. This is really where a little preventative action can save a huge amount of stress and effort down the line!